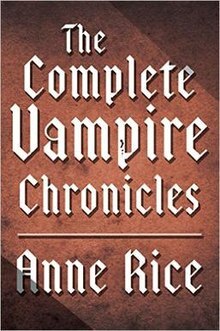 Slashfilm just informed me that Bryan Fuller is no longer attached to upcoming TV series adaptation of Anne Rice's Vampire Chronicles. I had no idea there was going to be a TV adaptation of these books, so there's nothing for me to mourn, but apparently it's still going to happen, albeit with Rice's son Christopher (also a writer) as executive producer. Maybe this series will still be great, but I think Fuller's loss is a real blow—Rice's writing is self-indulgent enough without a close relative (whose career has hugely benefited from his mother's fame) adapting it into a new format.